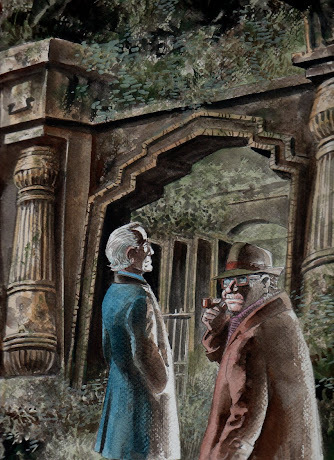 The critically acclaimed cult detectives Bryant & May created by Christopher Fowler are the stars of ten deranged novels that explore London’s most arcane mysteries, from its hidden rivers to its secret societies. And now, thanks to PS Artbooks and artist Keith Page, they’ve come to comics! 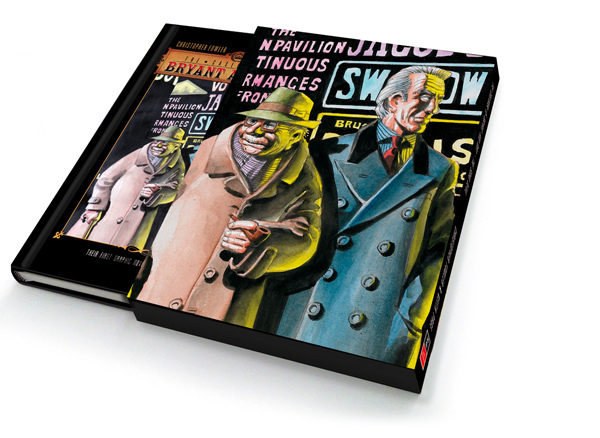 Christopher Fowler, a lifelong fan of graphic novels, has teamed with legendary Thunderbirds and Commando artist Keith Page to create a sumptuous, stunningly coloured annual of excitement containing a brand-new full-length adventure, a 1960s-set Untold Story, galleries, alternative full-page covers and trivia. Things like this need a special type of policing, jobs for John May and Arthur Bryant together with their odd bunch of misfit assistants. The fact that John and Arthur are the oldest detectives still working in London (some say since the 1940’s) only adds to the fun. 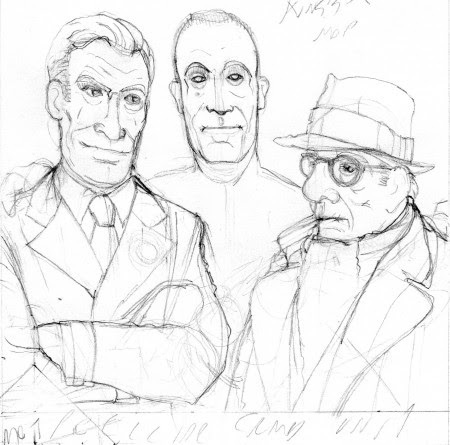 "Christopher's characters had always appealed to me," artist Keith Page tells downthetubes. "Although quite a difficult subject, I thought they would lend themselves to a graphic novel if treated in the right manner. 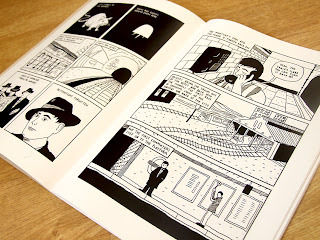 Chris had put a few of my drawings of the pair on his entertaining blog and last year he decided that the time was right to have a go at a full graphic novel. Which I jumped at, as you might imagine." Chris thought that an adaptation of one of the novels wouldn’t be quite the right approach. Instead he came up with a greatly revised treatment of part of one of his earlier books, Soho Black, which had featured John and Arthur in a minor role. "We also took the opportunity to portray a London which is not quite the present day one," Keith reveals - something he's tackled before in his wonderful Charlotte Corday series published by Timebomb Comics and Print Media Productions. "There are touches of Ealing comedies and other 1950’s ephemera, although all the settings are real and required either site visits or use of Google Earth Streetview for accuracy," he explains. "The Soho part of the story was already taken care of as I had done a lot of photography for another project. "I decided to use a pencil - and - watercolour technique, similar to that used on Charlotte Corday The Iron Moon graphic album to give a 'different' look. At the same time I had done a few paintings as 'alternative covers' for some of the novels. Chris wanted to include some text and ephemera items and I suggested that the project was now approaching something like a traditional 1960’s type annual. The publisher seemed taken with this idea, so Chris wrote an additional short story to give a total page run of 80 pages. For the second story, featuring a much younger John and Arthur in 1967, I used a 60’s Boy’s World/”Eagle type of technique of hand coloured black linework. "A fascinating project to work on, quite difficult but fun," says Keith. Along with this new graphic novel, there's good news for fans of the Bryant and May novels, which having achieved cult status, will continue. "Bryant & May are set to return in the UK with two new novels, Bryant & May and the Bleeding Heart and Bryant & Man and the Burning Man," says Chris. "So with the US getting back on schedule and the UK too, we’ll all be in synch again (although I have a feeling the UK will continue to publish first). 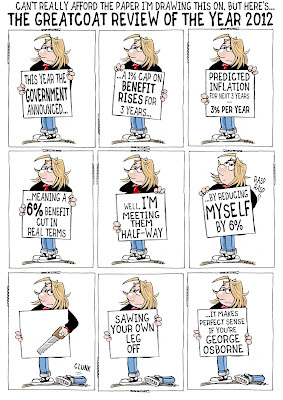 Along with the graphic novel arriving in January, it looks like a bumper time for the old fellas," he adds. "It’s just a pity TV companies have yet to commit to the series on account of competition from something called New Tricks which I have never watched. "The new books will, I hope, raise the bar for the matchless duo, and I for one can’t wait to get started." • The Casebook of Bryant & May - The Soho Devils goes on sale in January from P.S. Artbooks. More info: http://psartbooks.com/catalog/bryant-may-the-soho-devil.html. Limited to just 2000 copies and split across two editions, this book is available to order through either psartbooks.com or pspublishing.co.uk. Out now from US company Archaia Entertainment is a collection of its mini series Space:1999 - Aftershock and Awe, a new story using the characters and setting of Gerry Anderson's live action SF TV series. Written by Andrew E. C. Gaska with art from the late Gray Morrow (melding his work from the Charlton Comics Space:1999 series with new pages from David Hueso and Miki), the story is based on the events portrayed in the Space:1999 pilot episode “Breakaway” by Gerry Anderson, Sylvia Anderson, George Bellak and Christopher Penfold. For this new graphic novel, Gaska has set the adventure in an alternate universe where US president John F Kennedy, a key supporter of the space program who pushed for the moon landings, was never assassinated, but mankind has suffered through World War III, unified into a single world government - and built a base on the moon by the year 1999. 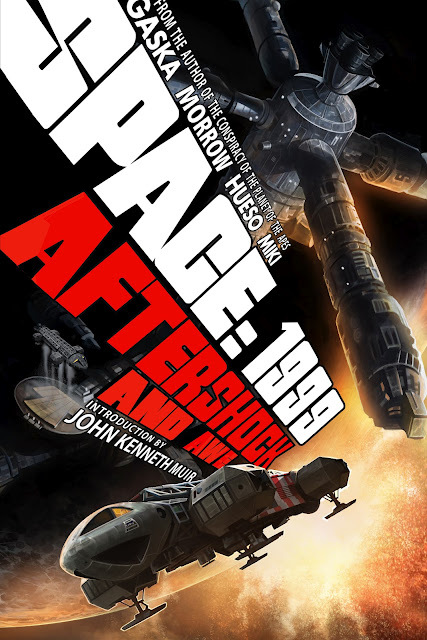 On September 13th 1999, an atomic accident causes the moon to be blown out of orbit and hurled into the unknown and the survivors of the lunar base stationed there are launched towards their destiny across the stars. But what of the cataclysm and wanton destruction caused to the Earth in its wake? This retro-reintroduction to the Andersons' series from the early 1970s follows nine lives who are forever changed by the carnage left in the moon’s wake. Told from the point of view of those left behind on a ravaged Earth, Aftershock explores the scientific, environmental, and social political repercussions of a world left with no moon. The story continues in Awe, which adapts the pilot episode of Space: 1999 “Breakaway”, as seen through the personal logs of Commander John Koenig and Professor Victor Bergman on Moonbase Alpha - expanded to include both new and unfilmed material, and utilizing the remastered art of comics legend Gray Morrow as a basis for this revolutionary retelling of a sci-fi classic. 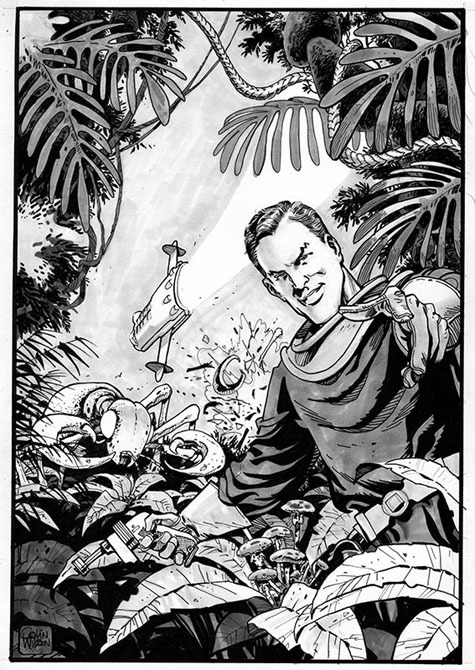 Andrew E. C. Gaska, who wrote the illustrated novel Conspiracy of the Planet of the Apes, ties together the “origin story” events of the original show’s pilot episode and an all-new tale, working together original art from Morrow and contemporary artists David Hueso and Miki, and fashioning the two stories into one. Since Space: 1999 was originally made in the 1970s and since the title year has long since come and gone, publishers Archaia are keen to point out that this graphic novel is highly accessible to those who have not previously been fans of the show. "Overall, it's my goal to take the best of Space: 1999 (its tone, characters, premise, etc) and augment them toward their logical conclusions in a way that old fans and new audiences alike can enjoy," Gaska reveals in an interview on the Archaia web site. "The television series originally aired almost 40 years ago, and while a lot has changed in the world since then, there is a lot of 1999 that still reflects today’s society and where we are headed. A new fortnightly series, Batman Automobilia Collection, launches in the UK in January from Eaglemoss, which distributors Comag say will offer Batman fans and car model enthusiasts alike the chance to collect the most iconic vehicles ever driven by the DC Comics hero. Aimed at predominantly at men aged 16 and over the 80 part work series will feature Batmobiles from the hit TV shows, blockbusting films and more than 70 years of comics, from its first appearance in Detective Comics No.27 in May 1939 to The Dark Knight Rises film in 2012. The Batmobile has gone through numerous incarnations, but has always been an innovative and inspirational vehicle for fans of the Caped Crusader. With weapons, gadgets and special abilities, it is almost a character in its own right in the stories for some, and its appearance is eagerly anticipated whenever a new one is designed. Every issue will carry a superb quality die-cast model of a Batmobile in a Perspex display box with a lenticular background. In addition to the Batmobile, each issue will carry a 12-page magazine that describes that particular version of the vehicle. 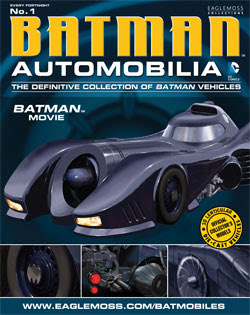 On sale for a month, issue No.1 of Batman Automobilia Collection is on sale 2nd January 2013 at the introductory price of £2.99 and will carry a Batmobile from the 1989 film Batman. Issue No.2 will be on sale 17/01/13 priced £5.99, with a model of the vehicle from the 1966 TV series. Issue No.3 will be on sale 31/01/13 at the regular price of £9.99, featuring the Batmobile from the 2005 film Batman Begins. Issue No.4, on sale 14/02/12, will have the car from 1995’s Batman Forever. 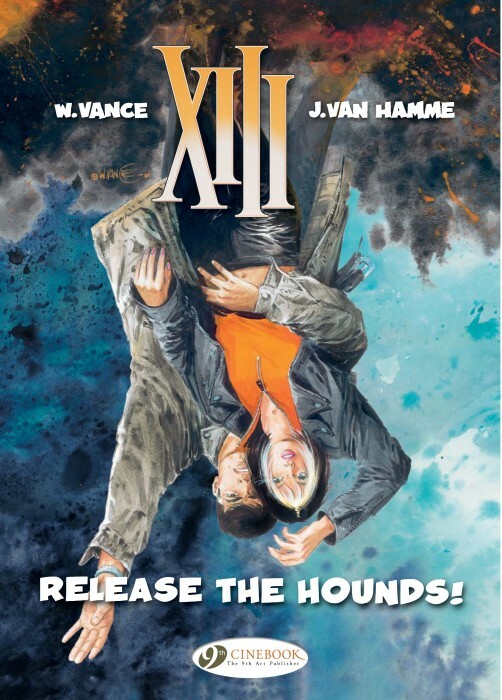 Just when we thought that we were on top of who exactly XIII is, writer Jean Van Hamme and artist William Vance are out to turn more than just the two cover characters on their heads in the latest book in Cinebook's XIII saga, Release The Hounds! XIII remains on the run from America's National Security Agency, the NSA, and their double agent Jessica Martin who also works for the illegal Executor organisation run by former KGB agent Irina Svetlanova. Jessica and three other NSA agents are prepared at all costs to stop XIII escaping from them while they are all on a sleeper train in California but, inevitably, he does with a reluctant Jessica in tow and after the high speed action in and around the train, they make their escape in, of all things, a hot air balloon. But can XIII trust a double agent who has tried so hard to kill him? After the James Bond shenanigans in the second half of the previous book, Top Secret, the train fight on a stormy night at the start of this one comes as no surprise, especially since fights in the rain are such a XIII staple. 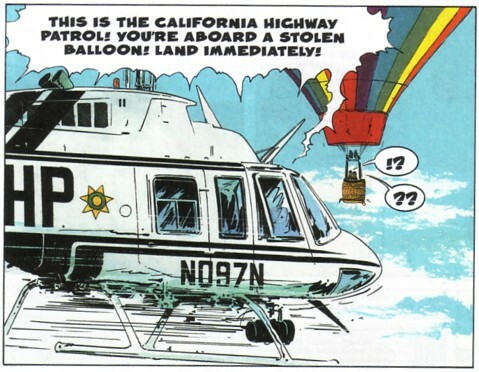 Yet the aerial escape in a hot air balloon proves to be a short lived quiet interlude as XIII continues to make his way back to his friends in San Miguel via Mexico with a multitude of killers after him. 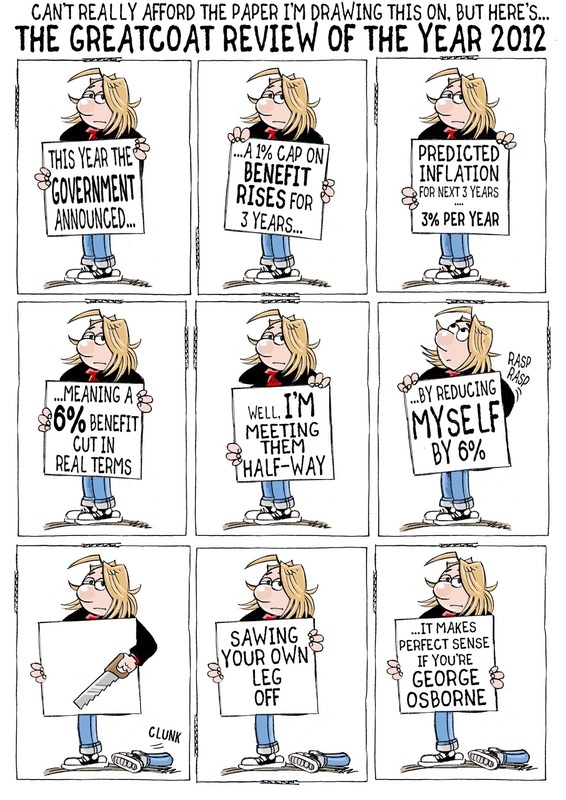 Jean Van Hamme almost pushes a little too far with this one. Partially I think it is to give William Vance a chance to show off his accurate aviation art as a selection of aircraft (Bell 206L Long Ranger, OV-10 Bronco, and a Cessna Skymaster) put in appearances as XIII heads south from the USA towards his friends in the Caribbean in a succession of different modes of transport. Partially it is also because Jessica's apparent change of heart over killing XIII early on seems a little too convenient to the plot and, given that we already know that she is a double agent, why does XIII suddenly trust her quite so much? However by the end we have an explanation and another twist that leaves XIII in yet another awkward position. As for that awkward position on the cover, with both XIII and Jessica upside down with Jessica's hair seeming unaffected by gravity, you'll understand it when you read the book. XIII - Release The Hounds! is not the best chapter in the ongoing XIII story but it remains an enjoyably entertaining one and, with Cinebook skipping the retrospective book in the series, The Investigation, that means there are now only four books to go before the conclusion of the saga when, hopefully, all will be explained. 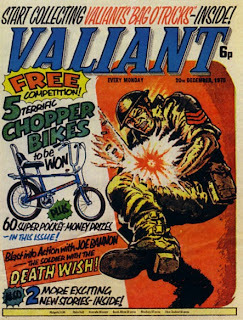 Hibernia Books, who have previously published licensed reprints of 1980s IPC strips Doomlord from new Eagle and The 13th Floor from Scream, are back with a factual fanzine about the weekly IPC comic Valiant and its links with 2000AD entitled One-Eyed Jack And The Death of Valiant. Writer David McDonald has created a 36 page magazine with a black and white cover, and black and white and colour interior images about Valiant comic and its Dirty Harry style cop character who foreshadowed Judge Dredd. 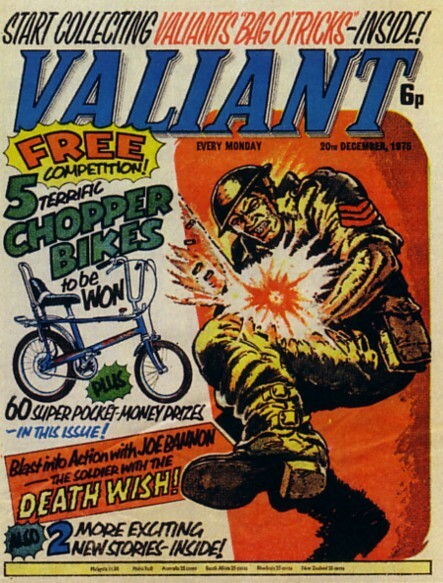 Split into five sections, the magazine gives an brief overview of Valiant weekly from its origins in 1962 before focusing on the revamp it was given by writer and editor John Wagner when he was tasked with revitalising the title in 1975. While this revamp gave the Sixties comic a more modern Seventies look, it did not halt the declining sales figures enough to prevent the title being amalgamated into its sibling title Battle Picture Weekly in 1976. David interviews John on the subject of his editorship of Valiant which makes a refreshing change from the more normal interviews with him which inevitably concentrate on his creation and writing of Judge Dredd. One of the strips introduced in the revamp of Valiant was about Detective Jack McBane, the New York cop known as One-Eyed Jack, written by John Wagner and illustrated by John Cooper. While Wagner took his inspiration from TV series such as The Streets Of San Francisco as much as movies, it was Cooper who based the visuals of the character on Clint Eastwood in Dirty Harry. 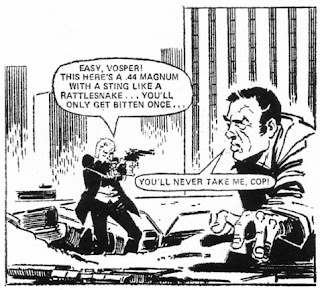 David focuses on this proto-Dredd character and interviews the now retired John about his art on One-Eyed Jack as well as talking about the rest of his career from Thunderbirds in TV21 in the 1960s to his recent Armitage strip in the Judge Dredd Megazine. John Cooper has rarely been interviewed before so it is a treat to be able to read what he has to say. The magazine concludes with an interesting piece on the background role of the Art Editor focusing on Jan(et) Shepheard who worked on Valiant, 2000AD, Starlord and Tornado amongst many other IPC titles, with contributions both by herself and former 2000AD staffers, editor Kelvin Gosnell and art editor/artist Kevin O'Neill. While this may sound like the least interesting section of the magazine, covering as it does the work of people who are rarely if ever mentioned, I found this a fascinating read which highlights a side of the comics that readers simply take for granted. 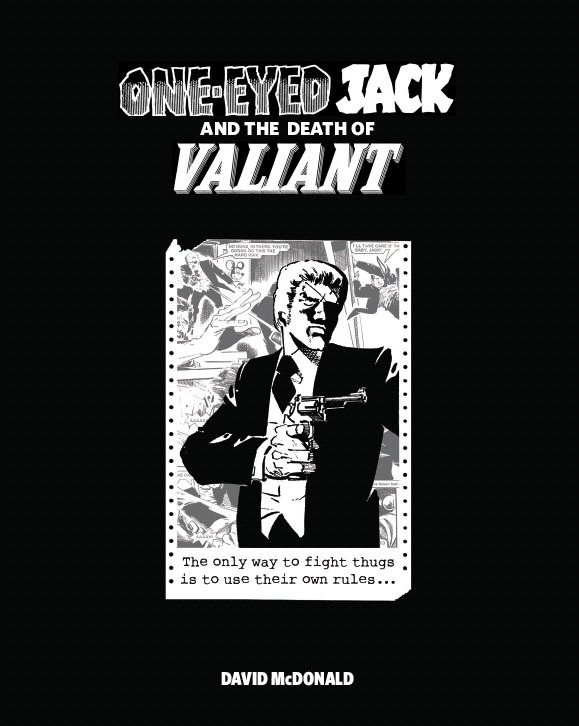 One-Eyed Jack And The Death of Valiant is available as a digital edition but I would think that the majority of readers will be from a background where they want a paper version in their hands and the print version is no let down. Professionally printed on matt paper that is just slightly shorter than A4, this is an impressive publication both from a production, a design and a writing perspective and is the first of a potential series of semi-regular titles covering older UK comics entitled "Comic Archive". As I said when the title was initially plugged on downthetubes, most of the writers here on DTT come from a factual fanzine (as opposed to a stripzine/small press) background and so we know what it is like to produce this sort of title and how difficult it can be getting interviews and 'new' hard facts that have not previously been discussed to death. One-Eyed Jack And The Death of Valiant is one of the best factual fanzines that I have read in a long time and I can't recommend it highly enough to both those interested in the general history of British comics as well as those who choose to focus on 2000AD alone. Sherlock Holmes: The Liverpool Demon #1, written by British creators Leah Moore and John Reppion and penciled by Matt Triano is on sale now in all good comic shops. 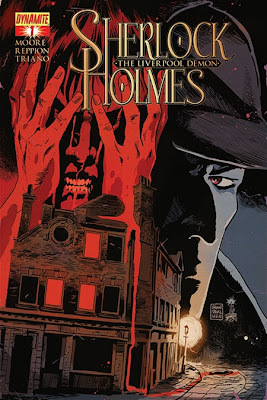 Leah and John's work on Dynamite Entertainment's Sherlock Holmes has been widely praised. Artist Mike Carey described their previous story, The Trial of Sherlock Holmes, as "A classic locked room mystery, deploying Conan Doyle’s core cast with huge skill and conviction" while Babylon 5 creator J Michael Straczynski enthused: "Forget what you’ve heard: Sherlock Holmes is alive and well and living inside this book!" Matt Triano is already known for his storyboard work, motion comic work, and artwork for various ad agency projects developing custom comics for high profile clients. His art can currently be seen in works for Robin Hood Charities in New York, Moonstone (Captain Action), Zenescope (Grimm's Myths and Legends, Robyn Hood, Sleepy Hallow, Story of Mankind), The Discovery Channel and Marvel Trading cards (Marvel Characters), as well as a Batman story for the DC Halloween Special. • There's more about the Liverpool Demon on Leah Moore and John Reppion's web site. A collected edition of The Trial of Sherlock Holmes is available. 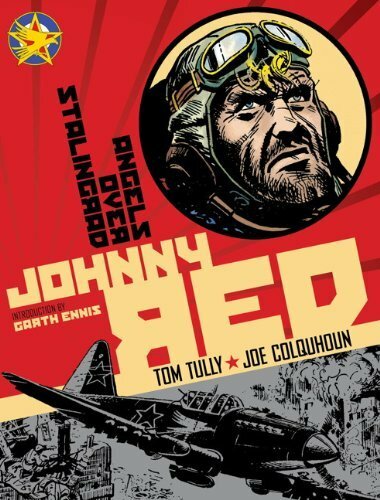 The final collection of Joe Colquhoun’s work on the seminal aerial combat story Johnny Red, which featured in Battle Picture Weekly, is out next month. Entitled Angels Over Stalingrad, this third volume in the series includes a feature on the Battle of Stalingrad by Garth Ennis (The Boys, Preacher, War Stories). Sadly, at present it seems this is the last Titan collection for now from the series, but Egmont are publishing digital editions of the comics, with two volumes already on sale - so let's hope that artist John Cooper, who took over the strip from Joe Colquhoun when Joe moved over to Charley's War, gets his day in the limelight, which he so richly deserves. 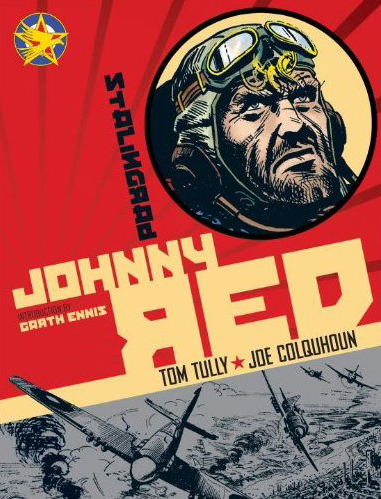 These collections are a fantastic tribute to both writer Tom Tully and artist Joe Colquhoun, neither of whom are still with us. 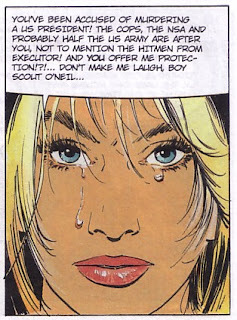 The Really Heavy Greatcoat by myself and Lancaster-based artist Nick Miller was published fairly regularly for about 20 years, last featuring in Comics International (yes - it was that long ago, now!). The strip was published for many years in alternative Lancaster titles such as On The Beat and Off the Beat and online on downthetubes.net and virtual-lancaster.net. If anyone ever offered to pay us to write it, it might still be running today - but Nick still creates an annual Review of the Year, bless him! The creators of Judge Dredd, John Wagner and Carlos Ezquerra, are teaming up once more to attend the London Super Comic Convention in February next year. The huge event at London’s ExCel convention centre on 23rd and 24th of February 2013 will have a distinctly 2000AD flavour - and not just with a stellar line-up of guests. It’s been a Dredd-filled 2012 with the release of DREDD 3D and 2000AD celebrating its 35th anniversary, and Wagner and Ezquerra are to be joined by fan-favourite artists Brian Bolland (Judge Dredd), Glenn Fabry (Sláine), and Brett Ewins (Judge Anderson, Bad Company). Other 2000AD guests already announced include Gary Erskine (Judge Dredd, Flesh), Mike Collins (Judge Dredd, American Gothic), Alan Grant (Judge Anderson), Peter Hogan (Robo-Hunter, Strontium Dogs), and Nick Percival (Judge Dredd, Sláine). One of 2000AD’s most popular characters, the Celtic warrior Sláine the Barbarian, celebrates his 30th birthday in 2013 and LSCC will be having a special competition along with Sláine-themed cosplay. 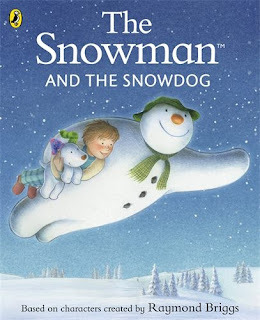 Book publisher Penguin has announced the purchase of Snowman Enterprises Limited, giving the company full control of key publishing, feature film, TV, digital and merchandise rights to Raymond Briggs' classic kid's character and brand, The Snowman. 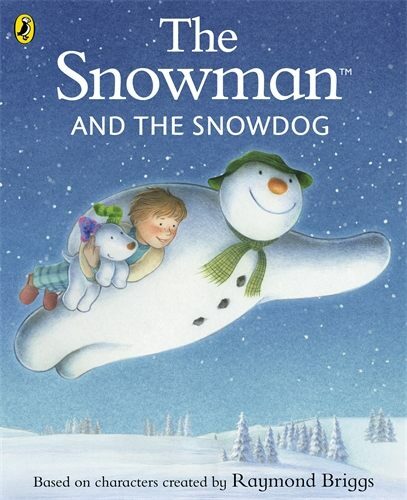 First published in 1978, The Snowman has gone on to sell 8.5 million copies of the book in 15 languages globally, with 3+ million of those in Puffin editions in the UK. An animated version of the book was produced in 1982 by producer John Coates and has aired annually on Channel 4 since. As we reported yesterday The Snowman and The Snowdog, a sequel, will premiere along with a making of documentary on Channel 4 this Christmas. Puffin will be releasing of an audio eBook of The Snowman and The Snowdog read by Sherlock Holmes star actor Benedict Cumberbatch, followed by new publishing in print and digital formats from 2013. 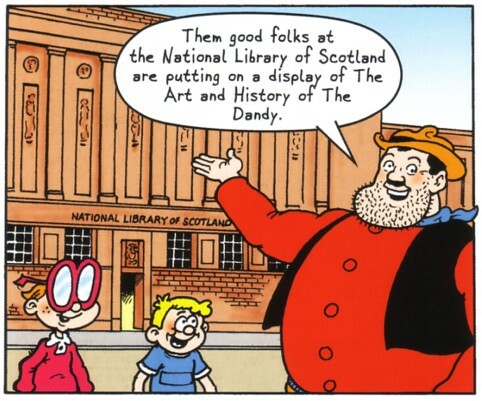 The celebrations of The Dandy's 75th birthday around the country include three different exhibitions, one in the Cartoon Museum in London, one in the Lamb Gallery at the University of Dundee (downthetubes feature here), and one in the National Library Of Scotland in Edinburgh. Located on George IV Bridge in Edinburgh's Old Town near the Castle, the National Library Of Scotland is one of the six legal deposit libraries of the British Isles (along with the British Library in London, the Bodleian Library in Oxford, Cambridge University Library, Trinity College Library in Dublin and the National Library of Wales). The NLS puts on a selection of free exhibitions throughout the year including one series under the title of 'Treasures' which change frequently and use a single room in the library's foyer. The current Treasures exhibition covers the Art and History of The Dandy and features a selection of original artwork, both black and white and colour, original scripts both typed and longhand, plus comics, annuals and various other Dandy items. While the exhibition is not large, it has an impressive array of items from all eras of the title. The NLS previous has put on the impressive Local Heroes: The Art Of The Graphic Novel exhibition which was featured on downthetubes here, and we also interviewed the curator of the exhibition, John Birch, on the main downthetubes.net site. 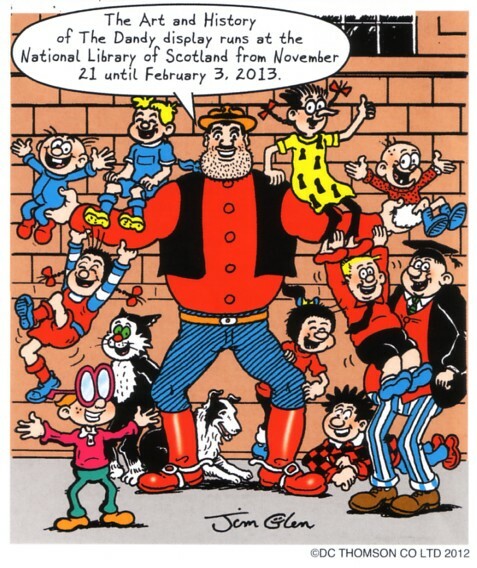 Issue 22 of the library's free magazine, Discover NLS, is also of interest as it includes a two page Dandy strip by long time DC Thomson artist Jim Glen especially created for the magazine featuring Desperate Dan and a whole host of Dandy characters delivering the items for display from the Dandy office to the NLS. Needless to say things do not go smoothly when Hungry Horace and Greedy Pigg discover the NLS's recently opened cafe. Discover NLS issue 22 is available to read on-line here. The Art And History Of The Dandy exhibition at the National Library Of Scotland runs until February 3 2013 and is free. There are more details including opening hours at the National Library Of Scotland website. 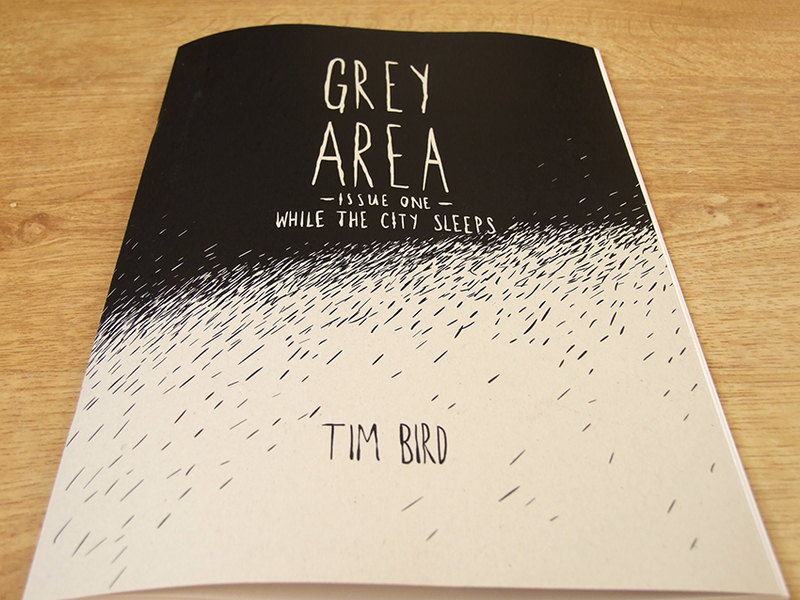 Avery Hill Publishing - " a small yet perfectly formed publishing company" - has announced the publication of Grey Area Issue 1, by British writer and artist Tim Bird. 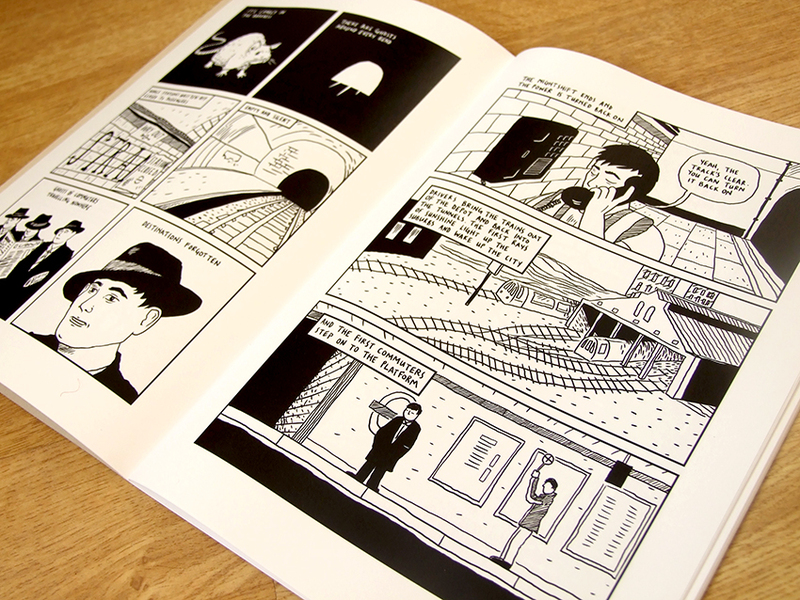 Titled While The City Sleeps, Tim's first full length comic is a paean to London and the culmination of an obsession that started when he moved to Golders Green in 2005, and is the first issue of an ongoing series featuring three vignettes exploring the metropolis at night. 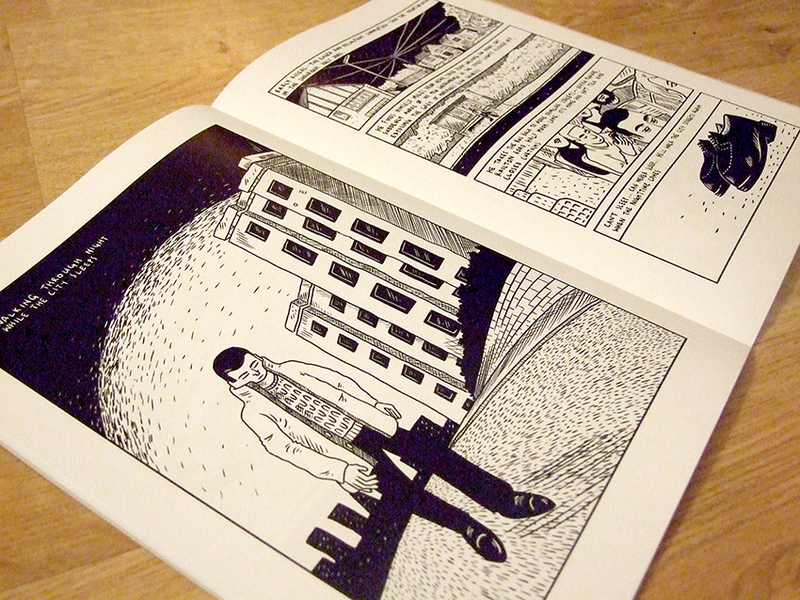 Anyone familiar with Tim's work will recognise the poetic yet documentary eye and the confident lines that have garnered comparisons with the likes of Daniel Clowes, Seth and Craig Thompson, as he takes a tour above ground and below, through the then and now, and across the spectrum of stark anonymity and hazy society that coexist in our cities while some of us slumber. "I took the tube to places across town," he says of creating the story. "Places with familiar names, unusual names, places where friends lived, places where there were good comic book shops, or second hand record shops. Tottenham Court Road, Mudchute, Kilburn, Camden Town, Finchley. "I wore comfortable shoes and carried my camera everywhere," he continues. "I photographed graffiti, bus stops, abandoned supermarket trolleys, tower blocks, barbed wire and construction sites. I would walk along the Regent's Canal from the Thames up to Little Italy, or along the Lea Valley from Tottenham Marshes out past the M25 into Essex - Waltham Abbey where shops close on Sundays." Tim, who lives in South London, is a prolific web comic creator whose works include It’s A Bird’s Life, about the things that happen in his life – some important, some mundane, some funny and some serious. "My comics take inspiration from the minutiae of city life," he says, "the stories found amid urban domesticity, the friends and family that I surround myself with." He has also drawn comics that feature in Tiny Dancing and Reads, both published by Avery Hill Publishing, and contributed to the 69 Love Songs, Illustrated project; and a short comic to the first issue of Off Life, the UK’s first street press comics magazine. After their hugely popular BBC Prom at the Royal Albert Hall this summer, Wallace & Gromit hit the road with Musical Marvels, a new family show with performances taking place at the Brighton Dome (30th March) and London's Hammersmith Apollo (31st March, 1st April) over Easter 2013. Wallace & Gromit's Musical Marvels, , a joint production between BBC Worldwide and Aardman Animations, is a family show with the audience invited behind the scenes as Wallace prepares to perform his Proms commission 'My Concerto in Eee Lad'. Specially-filmed Wallace & Gromit animated scenes reveal the duo's backstage exploits as the Aurora Orchestra keep the audience entertained with classical favourites. Following the interval there will be a special screening of the multi-award winning Wallace & Gromit film A Matter of Loaf and Death with the soundtrack performed live. 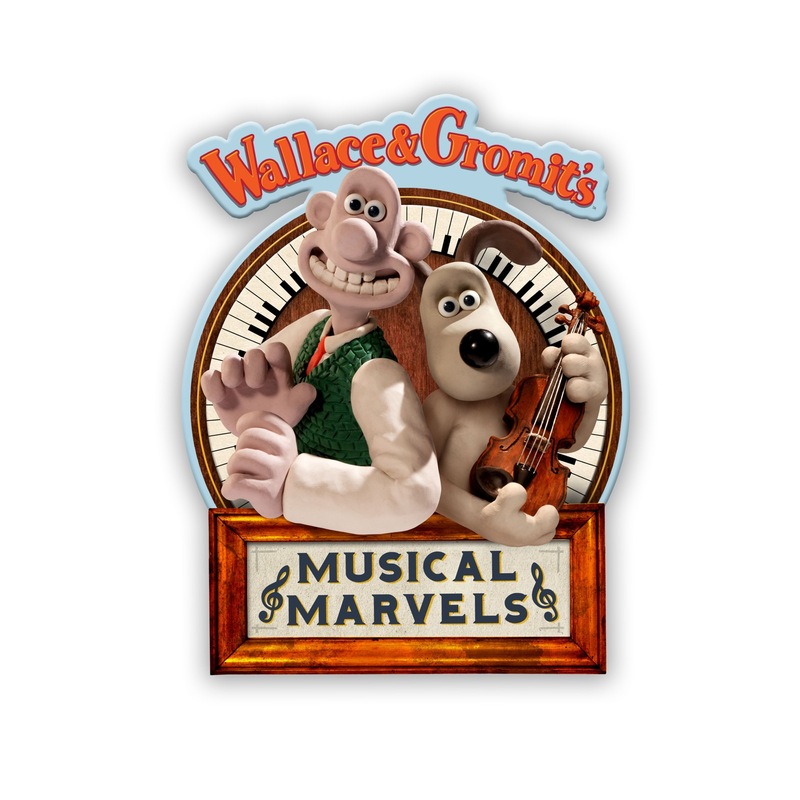 Merlin Crossingham, Creative Director of the show says; "I am delighted that Wallace & Gromit's Musical Marvels is going on the road, after such a fabulous premiere as part of the 2012 BBC Proms. It is brilliant that more audiences will get the chance to experience this great show, featuring live orchestral music and bespoke W&G animation." Wallace & Gromit's continued success beyond the animated TV stories includes a daily strip in The Sun, produced by Titan Comics, written by Bambos Georgiou and drawn by Mychailo Kazybrid. The city council has approved the plans proposed by The Beano publisher DC Thomson to honour The Bash Street Kids which were being considered for a location the city's west end, which Jeremy Briggs reported here early last month. First appearing in The Beano under its original title of When The Bell Rings in the issue dated 13 February 1954, editor George Moonie was inspired by the antics of the children of the High School Of Dundee, the playground of which could be seen from the windows of the Beano office, and he passed the idea to artist Leo Baxendale whose imagination did the rest. Major redevelopment work in the city prompted a proposal to name a new street Bash Street and a soft play area for children that will utilise Beano characters under license from DC Thomson, in part to celebrate the 75th anniversary of the comic in 2013. 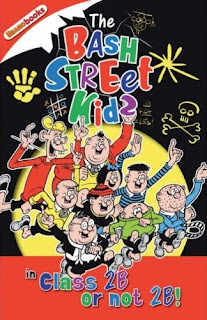 The Bash Street Kids will feature heavily in the new centre alongside Dennis the Menace, Gnasher, Minnie the Minx, Roger the Dodger and The Beano logo. Dundee City Council has now approved a request from DCThomson to allocate the name Bash Street to the street adjacent to 142/144 WestMarketgait which currently has no name. The street is beside a Travelodge hotel off West Marketgait and between the West Port Roundabout and Guthrie Street where DC Thomson used to have their printing works - and only a short walk from DC Thomson's Courier Building and the High School Of Dundee itself. • There are more details of the High School Of Dundee's connection with The Bash Street Kids over on Bear Alley. (with thanks to Paul Gravett): There are a couple of comics-related TV events on British TV this Christmas you might like to set your recorders for. Firstly, on Boxing Day, you can enjoy a new one-hour television documentary entitled Moominland Tales: The Life of Tove Jansson, billed in the Radio Times as: “A profile of the author behind the well-loved Moomins series about a family of trolls facing a range of adventures. As well as a contribution from comics guru Paul Gravett, others taking part include Finnish Moomin expert Juhani Tolvanen whose thoroughly researched study into the birth and success of the Tove Jansson’s newspaper strip for the London Evening News, entitled Moomin Every Day, is coming out early next year in English from Drawn & Quarterly. On the following Sunday, 30th December, to tie in with the premiere of The Snowman and The Snowdog, Channel 4’s new sequel to the animated version of The Snowman, there’s a ‘making of’ documentary called How the Snowman Came Back to Life on Channel 4 at 6.05pm, following the sequel’s repeat showing at 5.35pm. As well as an interview with Raymond Briggs, his many admirers including Posy Simmonds, Quentin Blake and Shaun Tan will be joining in and you might spot Paul among them too. • Moominland Tales: The Life of Tove Jansson airs at 9pm on BBC4 on Boxing Day. 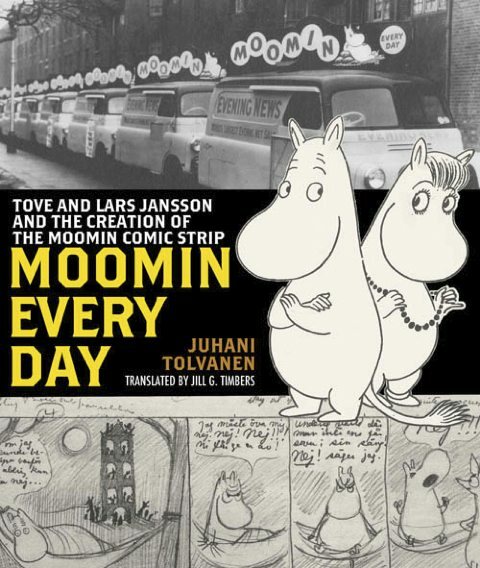 • While you're waiting, not re-visit the Tove Jansson exhibition Paul Gravett curated for the Belgian Comics Centre in Brussels in 2010. • How the Snowman Came Back to Life airs on Channel 4 at 6.05pm on Sunday 30th December, following the sequel’s repeat showing at 5.35pm. 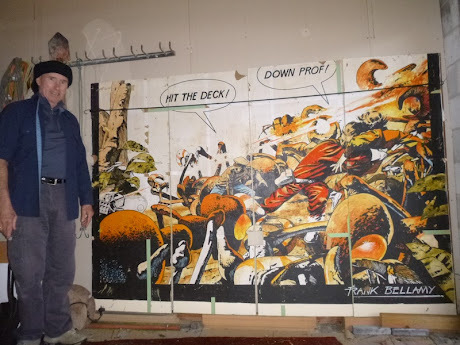 Several years ago comic fan Matt Emery, who writes the Pikitia Press blog dedicated to the work of Australian and New Zealand cartoonists, had the opportunity to have a rummage through artist Colin Wilson's studio. "Amongst his fine collection of European comics and art I found a folder of clippings from Frank Bellamy's run on Dan Dare from the Eagle in the late fifties," he notes in a recent post he's kindly allowed us to share here at downthetubes. "Colin professed to being a big fan Bellamy's work particularly another serial from Eagle, Fraser of Africa. "Recently Colin was contacted by Evan Jenkins in New Zealand who had bought a residence Colin rented in the late seventies. Jenkins discovered a large mural on one of the walls of the house, a recreation of a panel of Bellamy's Dan Dare. "Someone told Jenkins 'some comic guy' did it and Jenkins liked the painting so much he had it removed when he sold the house and it now resides in his garage down the other end of the country in Queenstown. "Colin remarked on the painting, 'It's obviously me copying a Bellamy Dan Dare panel from Eagle - November 7, 1959 to be exact - but how the hell could I have done this and not remember anything about it? And it turns up 35 years later in some guy's garage!'" 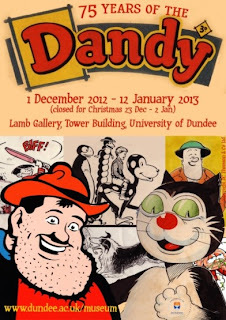 Announced at very short notice, the University Of Dundee held an official opening event for their new exhibition of original artwork 75 Years Of The Dandy on Saturday 8 December with the added bonus of getting five of the men working on the new Digital Dandy along to the University's Baxter Suite to talk about the new e-comic version of the venerable title. 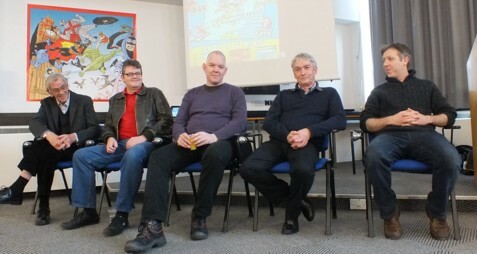 From left to right (above) they were - artist David Sutherland, Digital Dandy editor Craig Ferguson, writer Dan McGachey, former Dandy editor Morris Heggie, and artist Stephen White. Taking questions from the audience, the group talked about both the old and new versions of the title. David Sutherland is best known for his work on The Beano, including 50 years of illustrating The Bash Street Kids, and while semi-retired he admitted that he had been tempted to help out on the new version of The Dandy by editor Craig's offer of a fish and chip supper at the end of the day. Craig Ferguson had previously worked on both The Dandy and The Beano and both he and writer Dan McGachey spoke fondly of the good-natured rivalry between the staff of the two comics who worked in neighbouring offices. Morris Heggie talked at some length about the two original editors of The Dandy and The Beano, Albert Barnes and George Moonie, as well as the differences between the two publications with The Beano's move to child characters in the 1950s and The Dandy's more aggressive comic violence. Stephen White, also known as Stref', talked about the differences for an artist working on the older version of The Dandy as he had, compared to the new version of the title with its motion strips and the additional work that illustrating for such a format involves. The talk was good natured, yet informative as a remembrance by one of the group would often set in motion a completely new topic of discussion. 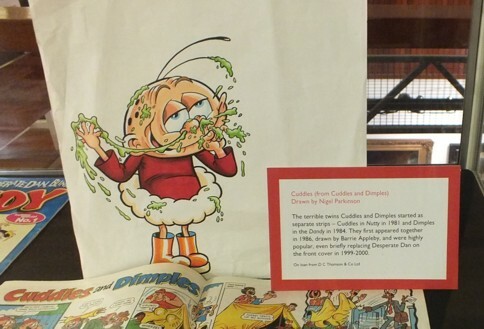 After a break for refreshments, the event moved to the University's Lamb gallery and the large display of original Dandy artwork, comics, annuals and various spin-offs. Morris Heggie gave an exhibition talk as he and the audience moved around the gallery looking at specific artwork. Stephen (above) pays attention to Morris' comments on Korky The Cat artwork by Charlie Grigg, while (below) Morris points out some rare initial sketches by Dudley D Watkins below the main image of his WWII era header for a Wild Young Dirky text story. ...however the two pages of Desperate Dan (below) were very much original Dudley D Watkins artwork and showed how his style of drawing the character had changed over the years between 1942 on the left and 1959 on the right. With so much artwork on display in the gallery, it covered the more modern Dandy characters as well as the older ones including this one (below) of Cuddles, of the terrible toddlers Cuddles and Dimples, with a slight problem with the cold courtesy of artist Nigel Parkinson. There were a selection of images from the new Digital Dandy around the walls in the Baxter Suite including a large poster image from the superhero strip Retroactive which we already know features the original Dandy superhero The Amazing Mr X. As no DC Thomson character with superhero-like powers will be off-limits to the new strip, whether they featured in the humour titles, the boy's adventure titles or the girl's adventure titles, this close-up image of the poster gives a little taster of just which characters may turn up in future issues. Congratulations to Chris Murray and Phil Vaughan for organising such an interesting event at such short notice and I would hope to see similar events at the University continue in 2013. 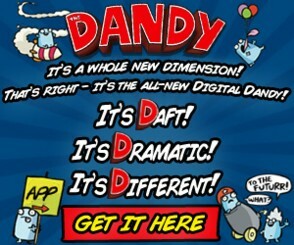 The Digital Dandy is available via The Dandy website, www.dandy.com or by clicking on the image below. The University of Dundee 75 Years Of The Dandy exhibition is free and runs in the Lamb Gallery of the University's Tower Building until 12 January 2013. 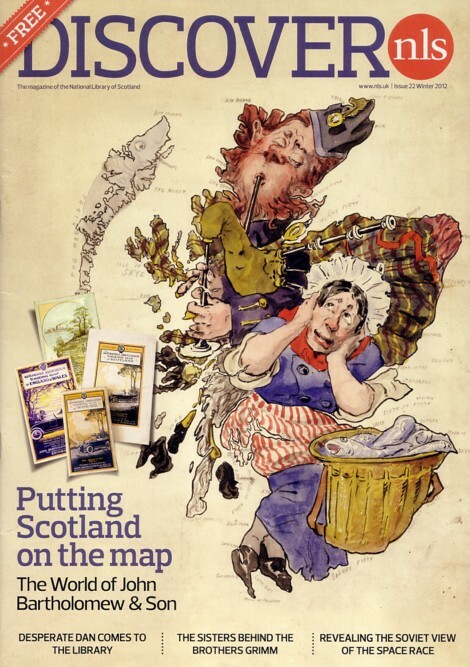 There are more details, including seasonal opening times and images of some of the original artwork on display, at the University Of Dundee Museum Services website. In the run up to Christmas there is always a need for a little extra inspiration when it comes to deciding which presents to buy (or put on your Christmas list). There is merchandise out there to do with British comics if you look hard enough. Today: Roy Of The Rovers. Tiger's Roy Race of Melchester Rovers is one of those few British comics characters that has entered the general public's consciousness and in recent times Roy of The Rovers copyright holder Egmont UK have been putting out a few books to cash in on this. However this Christmas Marks and Spencer have a range of 10 Roy of the Rovers items for sale in their stores featuring the long haired 1970s incarnation of the character. The full range of Marks and Spencer Roy of The Rovers merchandise is here on the M&S website and features a table football game, a mini-bagatelle, a blow football game, a leather wallet, a Man Of The Match trophy, an M&S edition of the Best of the 1970s reprint book, football hand warmers and perhaps the three items that would be of the most use, a metal keyring, a sports towel and a mug and socks set. Full details of all M&S Roy Of The Rovers merchandise are on the Marks and Spencer website.